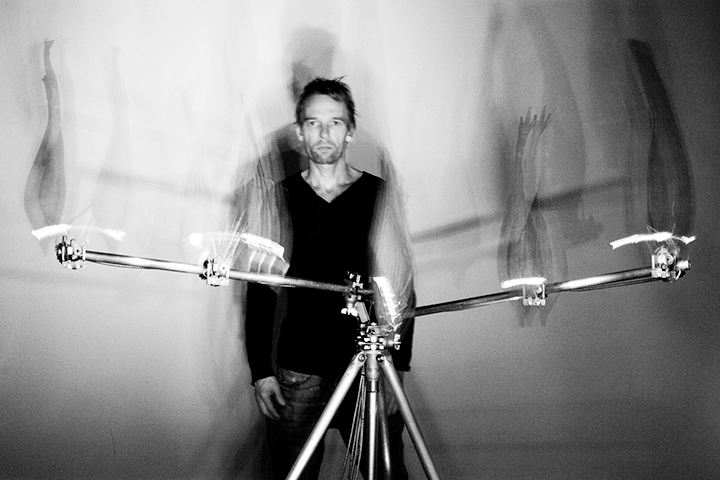 Dutch artist Christiaan Zwanikken (1967) has received international recognition through his kinetic and mechanical sculptures, sound works, performative and responsive installations. Using a variety of sculptural media, robotics, biology, micro-controllers, and sound— his work is both an artistic and technological experiment in which innovation and invention play an important role. His art has departed from the domain of plastic work in order to enter that of plasmic work. At first his pieces are clearly identifiable but as the interaction of the work with the viewer unfolds, they are given other potentialities and they take on new forms. In the hybrid animal installations, they attach themselves to any and all forms of animal life. By additionally hyper-synchronizing the movements of his work to electronic or acoustic sound compositions, Zwanikken creates what he calls ‘techno-plasmic entities’. These are new creations that jump along the evolutionary ladder and are not limited by their real-world anatomy. He received a BFA in sculpture from the Gerrit Rietveldacademie (1992) and a MFA in New Sculptural Media from the Rijksakademie (1994), both in Amsterdam. His studio is based in Amsterdam but he also works for extensive periods of time at his family home, a four hundred-year-old former Franciscan monastery, Convento Mértola, Portugal in whose supernatural environs he uses as a lab for studying and experimenting with natural processes.